Interest Income from Loans grew by 25% to total $287.27 million relative to $230.59 million reported in the same period of 2016. Interest Income Receivables was up by 21%, amounting to $1.47 million (2016: $1.21 million). Interest Expense totaled $24.45 million relative to $24.27 million in 2016; this represents a 1% increase year over year. As a result, Net Interest Income grew by 27% to total $264.29 million (2016: $207.54 million). Commission Expense grew by 26% to $3.26 million (2016: $2.59 million). Foreign Exchange Gain totaled $935,000 (2016: $6.77 million), a decline of 86%. Consequently, profit before taxation amounted to $49.98 million, 15% above last year’s $43.39 million. Following tax credit of $12,018 (2016: $3.15 million), net profit for the period amounted to $49.99 million relative to a profit of $40.24 million in 2016, a 24% increase. Net profit booked for the fourth quarter amounted to $19.39 million relative to $17.78 million in 2016. Total comprehensive income for the year rose to $52.25 million compared to $50.05 million posted for 2016. As a result, EPS for the period closed at $0.48 (2016: EPS $0.38). 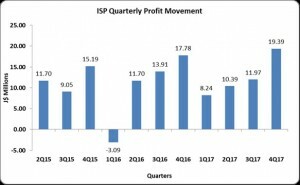 The EPS for the quarter was $0.18 (2016: $0.17). The number of shares used in our calculations is 105,000,000 units. The company’s stock price closed the trading period on March 29, 2018 at a price of $15.00. A at December 31, 2017, ISP reported total assets of $507.69 million, a 10% increase when compared to $461.11 million in the prior year. Loans, net of provisions for credit losses and Other Receivables contributed to the overall growth in ISP’s asset base. This as Loans, net of provisions for credit losses increased $124.24 million to $437.51 million (2016: $313.27 million), while Other Receivables rose 39% to $10.96 million (2016: $7.91 million). Shareholders’ Equity as at December 31, 2017 was $286.27 million compared to a $234.02 million in 2016. This resulted in a book value per share of $2.73 compared to $2.23 the prior.